The world's only truly global mobile satellite communications company. MCLEAN, Va., Feb. 1, 2019 /PRNewswire/ -- Iridium Communications Inc. (NASDAQ: IRDM) announced today that COO Scott Smith has decided to retire effective March 15th. Smith led Iridium's technology and operations, including Iridium® NEXT, which recently completed its final launch. Smith will continue to work with Iridium in a consulting role as the handoff to his successor is completed, with the company wishing him well in his greatly earned retirement. In conjunction with this announcement, the company is welcoming back to Iridium new Chief Operations Officer Suzi McBride. McBride will assume this position effective as of February 11, 2019. Smith first joined Iridium in April of 2010 with a primary goal of helping lead the company into the Iridium NEXT era. This included the design, development, launch and implementation of the new satellite network, including its ability to seamlessly maintain service for existing customers through the transition. During his eight-plus year tenure, the Iridium NEXT program went from concept to reality, with the final SpaceX launch taking place on January 11th and the first new service, Iridium CertusSM, going live for commercial service on January 16th. However, his contributions go far deeper than the Iridium NEXT program. Smith has also left his mark through several enterprise-wide accomplishments including instilling an ever-rigorous engineering and operational discipline within the company. These efforts increased network reliability, company efficiency and productivity, while ensuring a clear understanding of the return on investment of a project or product before its pursuit. In speaking of his time with Iridium, Smith said, "When I joined Iridium almost nine years ago, a daunting task sat in front of us. Replacing our first-generation constellation by itself would be tough enough, but replacing it with a constellation that had significantly improved capabilities while still being compatible with over a million existing deployed devices and never taking the constellation offline brought the challenge to a whole other level." Smith continued, "Iridium NEXT was a once-in-a lifetime opportunity, and I'm proud to have played my part in bringing such an extraordinary system to life. I've been truly lucky to work on such a world-changing project with so many wonderful people, and I know Suzi, my successor, is more than ready to maximize the potential of this new system. I feel such fulfillment in completing the journey I started in 1990, when I first began working on the Iridium dream. I walk into the next phase of my life with a smile on my face. My best wishes to all!" Iridium CEO Matt Desch shared, "We can't overemphasize how important Scott has been to Iridium over these past few years. Bringing Iridium NEXT to life and building state-of-the-art, satellite-based products and services are, in and of themselves, a career's worth of accomplishments." Desch continued, "We've been spoiled to have Scott leading these efforts for Iridium, and now we're being spoiled again by having Suzi back with us in her new role. We're very fortunate to be able to wish Scott a happy retirement with a monumental achievement like Iridium NEXT under his belt, while welcoming someone with Suzi's experience, expertise and leadership abilities. It's a good time to be us." Making a return to Iridium as COO, McBride will lead operations of the Iridium network, including the satellite constellation and associated ground gateways and terminals. This also encompasses all technology innovation on Iridium's new network, including the development and manufacturing of subscriber equipment, new services and applications. Prior to rejoining Iridium, McBride spent the past two-and-a-half years at OneWeb, where she served as COO and Senior Vice President. In that role, McBride built up OneWeb's team of engineers and oversaw the system design, production and testing of the ground and space networks as well as user terminal development. "I'm thrilled to be back at Iridium, especially at such an exciting time for the company, and in many ways my career has come full circle," said McBride. "I worked under Scott (Smith) designing and building Iridium NEXT up to launch, and it's an honor to have him passing me the COO baton." McBride continued, "I already know how strong the team and network are at Iridium. I am looking forward to helping lead the company into this next phase of capitalizing on the new constellation and offering exciting new products and services in the coming years. There are so many possibilities for new, small form-factor devices and the expanding capabilities of Iridium Certus, as well as the incredible potential for satellite-based IoT." 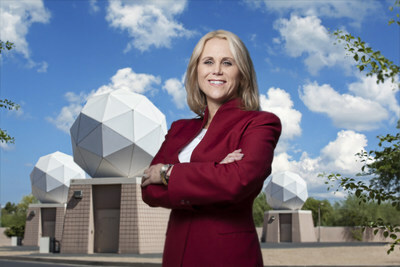 During her first tenure at Iridium, lasting over nine years, McBride served as Vice President of Program Management and Launch Services, playing a key leadership role in developing the Iridium NEXT system, leading launch strategy, engineering and hosted payload programs. McBride has more than 25 years of experience, including building and launching the original Iridium satellite constellation while at Motorola's Satellite Communications Group as a senior engineer in the 1990s. McBride received her MBA from the University of Tennessee in the Executive Aerospace and Defense program, and her dual undergraduate degrees are from Columbia University in Industrial Engineering and Claremont McKenna College in Management Engineering. McBride also holds a master's degree in Program Management from George Washington University and is Project Management Institute certified. Iridium is the only mobile voice and data satellite communications network that spans the entire globe. Iridium enables connections between people, organizations and assets to and from anywhere, in real time. Together with its ecosystem of partner companies, Iridium delivers an innovative and rich portfolio of reliable solutions for markets that require truly global communications. The company recently completed the last scheduled launch of its next-generation satellite network – Iridium NEXT - and plans to complete the upgrade in the coming weeks. Iridium Communications Inc. is headquartered in McLean, Va., U.S.A., and its common stock trades on the NASDAQ Global Select Market under the ticker symbol IRDM. For more information about Iridium products, services and partner solutions, visit www.iridium.com.